I have a lot of respect for folks that start out on their own in a new business – long hours and probably not profitable for the first couple of years. It takes a ton of dedication and hard work to make it successful. I love the opportunity to help them out if their products are good. This is no exception. 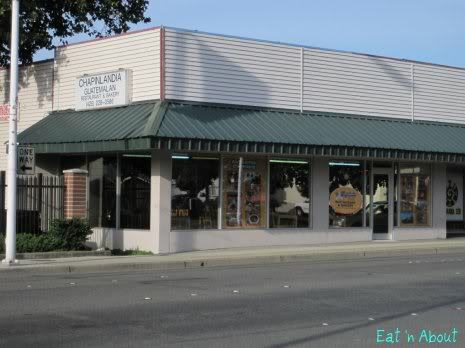 Wendy and I were the only ones here up until the end, which then it seems like their friends/family came to eat, so this place could use some publicity assistance from us! We started off with a couple of beverage juices. I was not too sure what to order at all since this is my first time eating Guatemalan food. 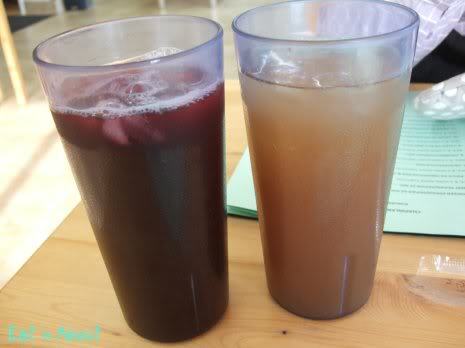 Wendy went ahead and ordered the Jamaica Juice (a Guatemalan cranberry juice) and I the Tamarind Juice. The drinks were very refreshingly tart-ish. It wasn’t too sweet and it tasted ‘authentic’, not like that Snapple stuff. I was clumsy (as usual) and spilled the entire glass during the meal. They were very kind in offering a replacement for free (forget that at a Chinese place), I repaid them in kind when it came to tipping. This reminded me of the sticky rice in leaf thingy from dim sum. But this was WAY bigger. The rice was more mushy (Guatemalan style, I assume) than I expected. 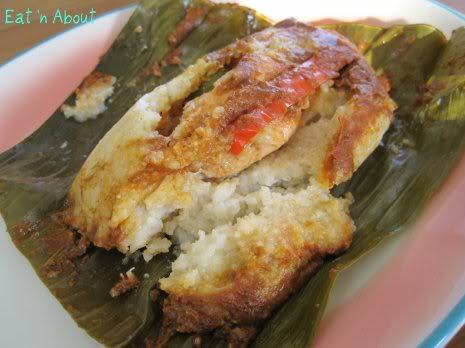 The Tamales de Pollo O Cerdo with Chicken was delicious. These guys really know how to cook the chicken as it was quite tender and juicy. The Enchiladas is supported by a beet-base and a crunchy tortilla on the bottom and a mix of lettuce, onion, cilantro (Wendy loves cilantro), cabbage, eggs, cheese and beef picado. It is definitely an interesting dish as we couldn’t figure out how to eat it. But of course, after spilling the drink, we were too sheepish to ask. 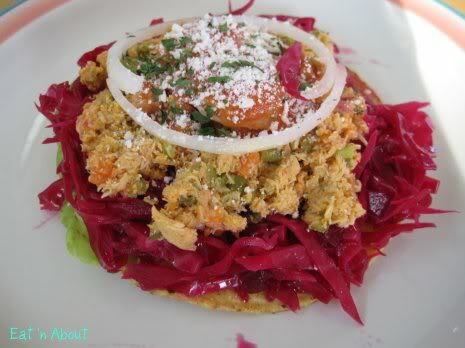 Nevertheless, the dish was good and I will probably try it again to find out how exactly to eat it – Guatemalan style. I have worked with tortilla shells for a good part of my life. I know when a tortilla is well made. 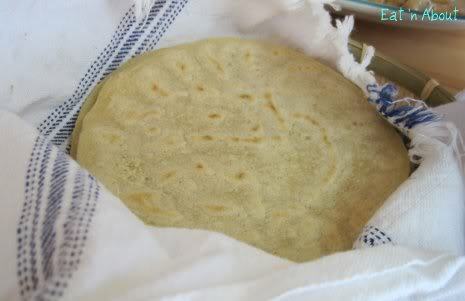 These are however different from the ones we’ve always had, as these were rice tortillas and they were quite a bit thicker (kind of like a pita) than what we’re used to. These were soft, very warm and very easy to chew on. I was impressed with these wraps as I piled parts of our entree into them to create “burritos”. 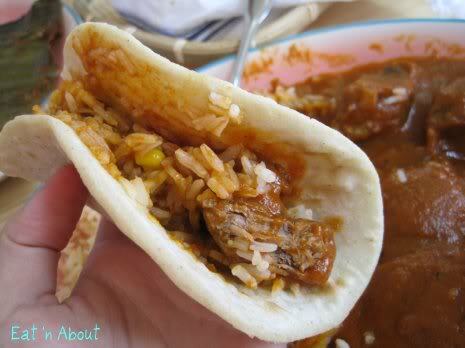 Tender meat+rice+good sauce+soft/warm tortilla = Mmmmmm.. yum. Wendy ordered the Beef Guisada. 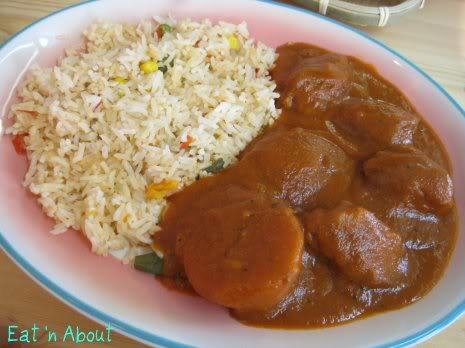 The beef seemed to have been stewed and the tomato sauce complimented it nicely. Most of the beef pieces were tender and thoroughly enjoyable. The rice on the entree seems to be more “dry” which I didn’t particularly enjoy but the soft tortillas were a great replacement. 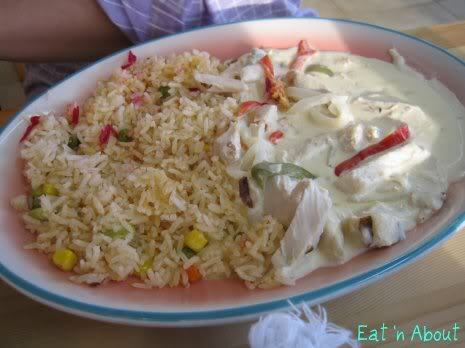 The Pollo en Crema (Chicken and Cream) looked and tasted very much like pasta from a local restaurant. The chicken was tender once again and the sauce tasted very similar to pasta cream sauce. I can’t complain as it was the better of the two entrees. The rice again, was the ‘dry” version, which doesn’t through me well, but once again, tortillas saves the day! This review was difficult to write as I have nothing to compare this experience with. 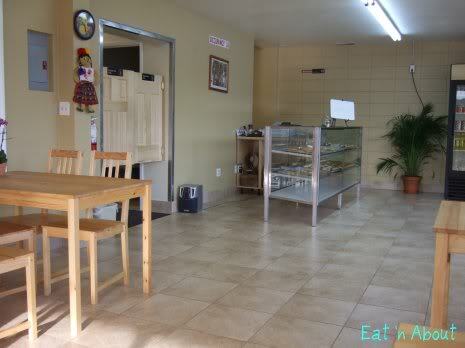 Secondly, I don’t know how to rate “good” Guatemalan food. I wrote straight up on our experience here alone. 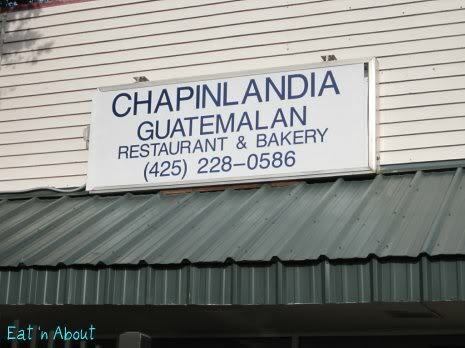 I do wish to further investigate into Guatemalan food to see how other locales compare. If you guys are ever in this part of town, do try!